OK, let’s keep this moving. I want to discuss the traditions of visual poetry with Karl Jirgens as well as his own work, and his poem, Heraclitus, seems a perfect place to start. Everything flows. What is here? How should we read? Let’s start from the top. Visually, two I’s joined together with a plus sign become an H. The ‘I,’ the subjective self, becomes H, the Heraclitean changeable self. I is another: I is a river and the self is the ever-flowing water. Or vice versa: The self is a river and “I” i-dentifies with the flow. “I me a river.” Eau-de-vie. But language shifts. Signs shift. The flow of the name: Heraclitus and the French form of this Greek, Heraclite, skid through time, down the page, become liquid: rivers which are both I’s (I-lands) and the vertical arms of H. The H which begins Heraclitus. The movement of names Mesmer I’s our two eyes. Motion on the page is time. Time is a blur of objects, names, or signs. Even words flow from one orthographic system to another. From one set of signs to another. I-is-another. Me:ander. H is breath. Panting. Ta Panta. Voweling. The EIOU in the center of the Heraclitean quote. Like breath or tide in quotidian. And it’s hard to read H in visual poetry without thinking of bpNichol’s H which is also an I turned on its side. Greek to English. And now to French. my life that I drink like a water of life/fountain of youth/alcohol. 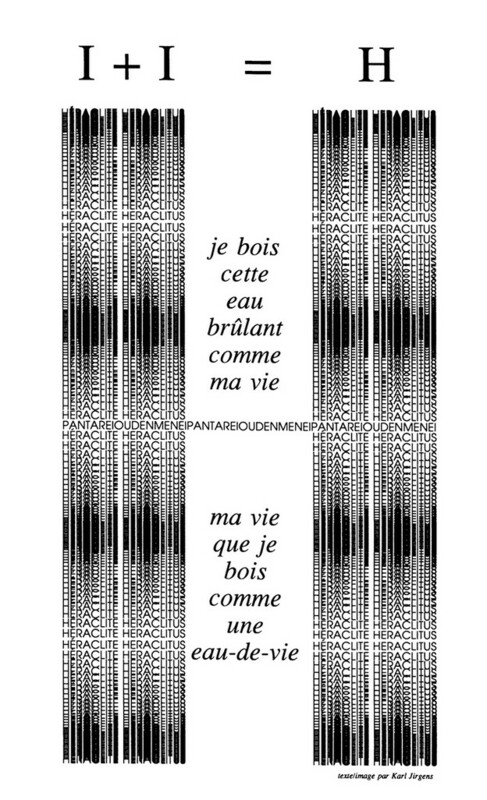 It’s from Apollinaire’s Zone, changed from the second into the first person. The continued play of the self. You are another ⇔ I is another. Nothing stands still. What burning waters does the “I” drink: the changeable waters of time? You can never drink the same brandy twice. Life is intoxicating. You see double: the before and after. The now and then. You slur your words as the tongue furs and time unfurls. Go with the flow. Of time. Of words. Of signs. GB: Karl, I’m very interested in how this poem locates itself in literary time—in a stream of references. Could you speak about how you engage tradition through quotation and paraphrase and how you alter the context of the sources? I know you’ve been interested in Dada, Surrealism, and the early avant garde. KJ: Thanks very kindly for asking. Yes, both literary time and time itself are depicted in this piece. I paraphrased Heraclitus’ “Panta rei, ouden menei” (Everything flows, nothing abides). I deliberately removed the “kai” (“and”) from Plato’s recounting of Heraclitus’ maxim because there is no need for a conjunction when speaking of a continuous flux of time. There is of course an irony in the piece, because the only thing that does continue or “abide” is change itself. I combined the quotation from Heraclitus, and another from Apollinaire’s Zone (from Alcools), to gesture towards self-destruction combined with creation. Apollinaire’s line has a double-edge, much like the “H” because it speaks of drinking the waters of life, but with each sip of that burning water one inexorably moves towards death. And so, the quote from Apollinaire is deliberately divided, separated into two parts by Heraclitus’ statement on the flux of time. Simultaneously, the two “I” figures in the “H” with its typographic sine-waves are joined by Heraclitus’ statement about the flux of time (I + I = H). So, the piece speaks of both joining and division by virtue of temporal flux. In addition, we have the actual “I” (the self, the author, etc.) and the “I” represented in textual format. But this second (represented) “I” alludes to the fact that the signifier is not the thing itself. The (implied) actual “I,” and the “I” represented both allude to the “Treachery of Images,” as exemplified in Magritte’s “Ceci n’est pas une pipe.” So, there are indeed two “rivers” that flow in any representation or artistic expression. I could add to this by saying that the piece’s construction exploits Duchamp’s Dadaist principle of re-contextualization (i.e., moving a thing from one context into another, thereby altering its meaning). So, I re-contextualized statements by Heraclitus and Apollinaire. Also, the piece also adopts a neo-Cubist strategy in that it strategically juxtaposes several spatio-temporal reference points simultaneously on a single surface. GB: One of the goals of this commentary series is to explore how one might ‘read’ a visual poem. I’ve unfolded one way to possibly read your poem above. Could you comment on how you see reading the visual poem and what strategies one might bring to such a reading? KJ: Yes, when shaping this piece, I did have an imagined audience in mind. In a way, you are an ideal reader, Gary, because you’ve astutely identified a range of nuances. Walter Ong once said that “the audience is always a fiction,” and in a sense I had a fictionalized readership in my mind, when shaping the piece. So, the I + I = H was intentional. And we have the “eye” who creates, and the “eye” of the reader. Also, I wanted several “windows” of thought to open up in the piece. The quotations from Heraclitus and Apollinaire, the combined I + I = H format, the sine-wave typography, and the physical placement of the elements all gesture to the flux of time and life. There is a connection to liquid imagery generating a sense of rhythmic flow. So, while there is a kind of narrative disjunction in the piece via the different “voices,” there is also co-relative integrity through the network of liquid images, alluding to the ancient idea that “you can’t step in the same river twice.” The reference to Apollinaire’s Alcools, and the computer-assisted typography help connect to the present day. GB: Though you play with the visual representation of words, in this poem, you maintain several conventions of textual reading: reading from the top down and left to right, and an alignment against an implied vertical/horizontal grid (the words of the text are presented ‘right-side-up’ and relatively normatively in terms of size, font, spacing, and indeed the fact that they form words.) How do you see the relationship between the visual and the textual in this piece and in writing in general? KJ: Great question. The sine-wave like typography used to compose the H itself, the reference to Apollinaire’s burning water, and the Heraclitian idea of flux, are all juxtaposed, whether in conventional textual format, or through modified typographic stylistics, towards a single purpose. So, all of the elements in the piece are in a dialogue about the fluid pulsations of what we think of as “time.” Through the juxtapositional strategies this piece transcends conventional textual modes because it incorporates several different ways of talking about the cycles of time with gestures to the rhythms of days, years, and human life-spans “ma vie que je bois comme une eau-de-vie”). But in other ways, it deploys conventions of textuality with standard format left-to-write composition. However, much of the piece arranges itself in the mind after one reads it, particularly when one recognizes the inter-connections between the elements (sine-waves, Apollinaire’s burning water, Heraclitian flux, etc.). GB: You have had a longstanding interest in time and its representation in your work. Indeed one of your fiction collections is entitled A Measure of Time. Could you speak a bit about this? KJ: Of course, time is probably an illusion if one adheres not only to contemporary understandings of physics but also to perceptions of indigenous peoples, such as the Hopi, whose language is confined to the present tense. And, if linear time as such, doesn’t exist, and instead we are all part of an ever-expanding moment that arises from what we call the “Big Bang,” then, that moment is omnipresent and universal. So, while things metamorphose, fundamentally, they are still the same things, composed of the same atomic particles. The juxtapositional strategies that I deploy in this piece simply offer several angles or perspectives on the idea of flux, and that’s why I like to think of it in neo-Cubist terms. In a sense, the piece is both analeptic and proleptic, simultaneously scanning the past and the future, which are both part of a single moment. The ancient Hindus call the duration between one Big Bang and the next, a “Kalpak.” Now, imagine a series of Kalpaks which are nothing more than a musical beat in the dance of Nataraja or Shiva, as part of a rhythmic cycle of universal destruction and re-creation; a musical pulsation. Such pulsations are evident on the tiniest sub-atomic levels, and are integral to the immense patterns of “all that there is.” One could use fractal theory to expand on this topic. GB: Anything else you’d like to say further about this piece? Or visual poetry in general? KJ: I do enjoy visual poetry very much because it appeals to different parts of the brain when compared to more conventional forms of textual expression. Right lobe. Left lobe. The old cliché; there’s nothing right in my left lobe, and there’s nothing left in my right lobe. Hah. And, I guess, it might help to know that this piece was first published in Quebec City’s exciting contemporary art periodical, Inter (edited by Richard Martel and company), upon invitation for a special issue on Heraclitus. However, it also happened around the passing of bp Nichol, so it ended up being an homage to bp, whose favourite letter, the “H,” is a partial palindrome if read from left to right or right to left (although not a perfect palindrome, like an “O”). So, it is also an homage to Nichol. I think one of the strengths of visual poetry lies in the initial visual impact of such expressions, and then, one needs to look at them again, because there is often more going on than immediately meets the eye. If it’s effective, then, visual poetry should make you think, get you on a different wavelength. Karl Jirgens is the author of both fiction and scholarly studies. His scholarly articles on postmodern and postcolonial literature appear widely in international journals, His theatre/performance works have been presented nationally and internationally. Jirgens has edited Rampike, the international literary journal of post-modern art and writing, since 1979. He is an associate professor in the Dept of English Language, Literature and Creative Writing at the University of Windsor. He is currently writing a novel as well as a scholarly study on the interface between literature and digital technology. Jirgens is also a grand-master of the martial art of Tae Kwon Do.